Table for Battle Brothers 1.2.0.19 + aob (win32). Stats - open the inventory screen, activate the script, select the desired fighter, remove / put on any item of equipment. The values appear in the table (HP, AP, Fatigue, Resolve, ...). Change them. Take off / put on any piece of equipment again, new values will appear in the game. Deactivate the script. Perks - open the inventory screen, activate the script, move the cursor on any fighter. The table will show the number of Perks of this fighter. Change it. 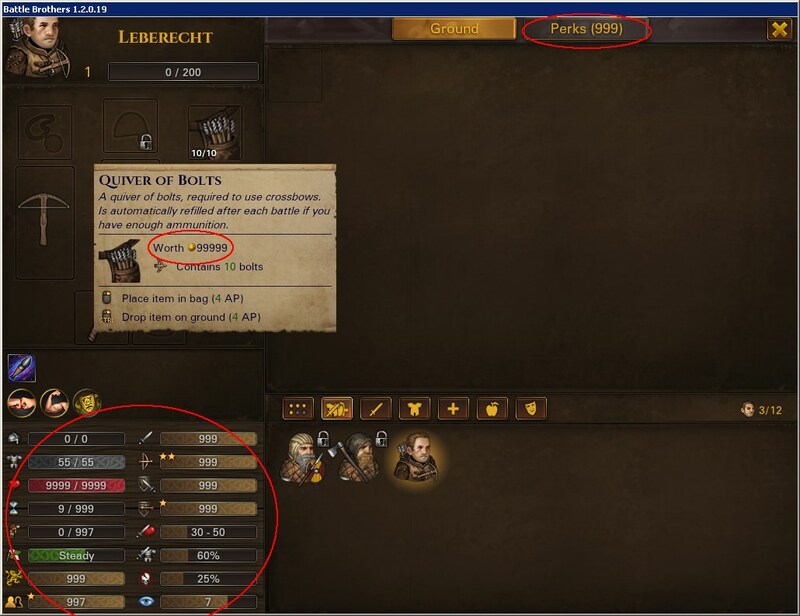 Exit the inventory screen and re-enter, a new number of Perks will appear in the game. Deactivate the script. Worth - open the inventory screen, activate the script, move the cursor over any item. The Worth number appears in the table (base, for 100% of the item). Change it. The value in the game immediately change. Deactivate the script. This script also works in stores for all products (you can buy for 0, change the price and sell for 9999999). Map - go to the world map, activate the script, turn on the passage of time. The entire world map opens, showing all cities, objects and enemies. The script can always be enabled. If you deactivate the script, the map and fixed objects will remain, and the moving will disappear. * Important: "Perks" and "Worth" scripts do not work at the same time, include only one at a time. - Added Teleport. The * key on the numeric keypad takes the squad to a point in the center of the screen. - In "Stats" added "Vision". - In "Stats" added "Fatigue+". This is the number by which the Fatigue value is reduced each turn in combat (the standard is 15). - the work of the Stats script has been changed, now the script works more stably on different systems. - Added Food and Wage values. Food - the character's consumption of food per day, if = 0 for all, the food supply does not decrease. Wage - the basic value of wages per day. - Added a large group of Extra. These are multipliers for different values (EXP, HP, AP, Damage, Wage and others). Important: all changes to the values that are contained in the Extra group are not saved by the game; when the game is restarted, they will be set to standard. Last edited by AlexS on Sat Dec 15, 2018 2:09 pm, edited 2 times in total. This is a Stats script with a different filter. Still can you make a map speed (or teleport) cheat? BB was a bit of a gripe for me, as i always had issues with doing exactly what i want via CE. It's a save editor, just read the instructions and follow carefully. As mentioned in other topic regarding BB - it's easier to edit save than memory in this game. Teleport. Version of the game 1.2.0.19. On the world map, activate the script, turn on the passage of time. When you press the numeric keypad button *, the squad teleports to a map point in the center of the screen (if there is water in the center of the screen, then water). Note. If you teleport away to another area of the map, the squad icon sometimes disappears. Click on the map so that the squad begins to move, then the icon will appear. Another way is to enable / disable CAMP. it does not activates unfortunately, but hey... Thank you for your hardworkingship. Strange ... I checked on versions 1.2.0.19 and 1.2.0.17 (win32 steam release codex ...). Is the script not activated or does teleportation not work? Check these scripts for the test. Turn on the time on the world map and try to activate "script test 1 AOB" and "script test 2 AOB". Did any work? If so, what does the line below the script show? edit: don't know why i cant activate script 2 and the float value is irreguler number when moving. edit2: i assume script 1 conrols horizontal soordinate wile scrit 2 is vertical. Now check out this test. Turn on time on the world map, activate "script test 1 AOB" and activate "script test 2" (red). Important: this script "script test 2" without aob, if it does not work as you need the game can freeze. If it works, did the coordinate appear in the line below? If yes, then click in the game button "Center Camera" (red arrow). The values under the scripts "script test 1 AOB" and "script test 2" should be the same. They are the same? Good. Try this teleport. All the same, the * button on the numeric keypad. It works?